10:50 AM EST Quarter sized hail reported near Monticello, FL, 29.7 miles ENE of Tallahassee, FL, penny to quarter size hail along fulford road about 2 miles east of highway 19. 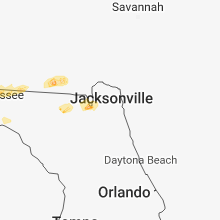 1:33 PM EST Quarter sized hail reported near White Springs, FL, 66 miles W of Jacksonville, FL, social media relayed a photo of quarter size hail in white springs. time estimated by radar. 4:50 AM CST Quarter sized hail reported near Blountstown, FL, 48.3 miles W of Tallahassee, FL, estimated on the road between blountstown and altha.